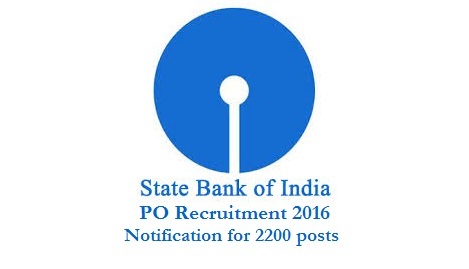 State bank of India has released recruitment notification for the post of probationary officers (PO) in SBI branches all over the India. State bank of India has inviting the applications from the eligible Indian citizens to full fill the 2200 probationary officers (PO) Posts in the State Bank of India branches. Candidates who want to settled in banking field this is the better opportunity for them. Interested and eligible candidates have to apply for probationary officer posts through the SBI official websites www.sbi.co.in then select careers link www.sbi.co.in/careers or www.statebankofindia.com/careers people may also see the complete advertisement on State bank of India official link and employment News / Rozagar samachar issue dated on 14.05.2016. Presently starting basic pay is Rs. 27,620/- (with 4 advanced increments) applicable to JMGS-1 with D.A, H.R.A/ Lease Rental, C.C.A, Medical and other allowances & Perquisites as per the rules in force from time to time. The total Compensation per annum would be a minimum of Rs. 7.55 lacs and maximum of 12.93 lacs depending on the place of posting and other factors. Note: Candidates who want to apply for SBI PO Recruitment 2016 , they should refer and Remind SBI PO Exam pattern were changed click here for SBI PO Exam pattern, and SBI PO Exam Hall tickets / Admit cards can download one week or 10 days before the SBI PO Prelim Exam 2016, people can download SBI PO Exam Admit Cards / Hall Tickets From the official website.